Barefoot Holidays DMC ST.LUCIA congratulates Jade MountainResort, a Virtuoso Partner on Saint Lucia, on their newly achieved title of #1Honeymoon Resort in the Caribbean as noted in the April 2012 issue of BRIDES Magazine.As described by BRIDES, the decision was made after theMagazine “teamed up with the elite travel advisors of Virtuoso to find the bestresorts, cities and islands for your big getaway. 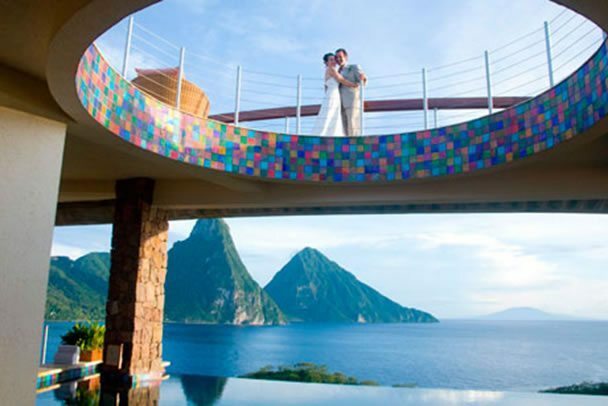 The winning combination ofthe majestic natural beauty of Saint Lucia and the stunning architecture ofJade Mountain are perfect for lovers.Thumbs up to this breathtaking resort from the entireBarefoot Holidays Team! We look forward to continued success together.